This site became available in September 2005 due to the number of requests we received from those who visited the site for the BHS Class of 1963. 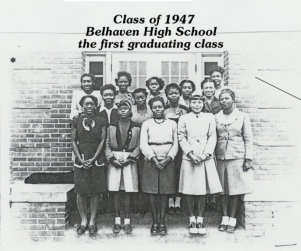 This site is designed to help renew the strong bonds that were formed at Belhaven High School and to keep you informed on plans for our annual HOMECOMING Celebration which is always hosted during Mother's Day Week-end. It has been said that a person without knowledge of himself is like a tree growing without roots. Each of you have some knowledge about our Hometown and dear old Belhaven High School. It is our hope that you will continue to share that knowledge with fellow alumni and the descendants of Belhaven High School Alumni. Over time, we have forgotten so many things and often we somehow have those that we remember all scrambled together. Through this site, we can improve our memory as well as fill in the gaps in our own memory banks and preserve our heritage for those who come after us. The younger generation needs to know where "they come from" so that they will know "where they are" and "where they are going". Some alumni classes have been faithful in assembling each year and are to be commended for their diligence and support of the Belhaven Alumni Club, an organization that is truly ours whether it's the parent chapter in Belhaven or one of the daughter chapters - Triangle or New York. Prior to the Grand Reunion I, classes assembled on the year they were being recognized and then wait 10 years until the next assemblage. The Grand Reunion I, in 2007, was designed to change that and make each homecoming celebration a reunion of alumni, whether they graduated from Belhaven High School, John A. Wilkinson High School or Northside High School. Homecoming 2007 was indeed a Grand Reunion as alumni converged from the states of California, Washington, Massachusettes, Georgia, Mississippi, New York, New Jersey, Maryland, Virginia and throughout North Carolina to celebrate the 45th homecoming celebration hosted by the Belhaven Alumni Club. Since that time, our celebrations have grown and the younger generations are beginning to "catch the spirit". We received a lot of positive feedback about the 2007 Reunion and we repeated it in 2008 with Grand Reunion II. We commend everyone who participated and/or rendered assistance in the planning and execution of those plans. The 47th - 49th celebrations were coordinated by the Triangle Chapter and were well attended. Celebrating our Golden Anniversary in 2012 was a labor of love due to the generous support and cooperation of alumni. Please note that without your support the Annual Reunions would be impossible. It is written that "coming together is a beginning, working together is progress and staying together is success". We agree with that nugget of wisdom. Since we came together in 2007 and worked together for the Grand Reunion I, staying together has been easy though not without its challenges. To continue this tradition, we need your continued support. Please help us to spread the word about the annual Homecoming Celebrations among those with ties to Belhaven. Please extend an invitation to them to join you for Homecoming '18 to be held during the Mother's Day week-end and will be our 56th celebration. We have included a school roster page on this site and encourage you to add your biographical sketch. We also request that you sign the guest book with comments and/or share new ideas for '17. Please note that any personal information that you submit on the class roster page will not be displayed unless you insert it in the space for comments. For those who do not have a personal computer, please take advantage of the internet access that your local library provides, normally free of charge. We expect to see you in 2018 for our 56th Alumni Reunion Week-end. The roll will be called and you must be present to answer. WE ARE WAITING TO HEAR FROM YOU! Many hours of planning and lots of energy, creativity and stamina were required to coordinate the activities for the 2007 and 2008 Grand Reunions and our Golden Anniversary Celebration in 2012 and your help is still needed and appreciated. We are counting on you! Our companion site http://belhavenhigh1963.myevent.com is no longer active. Thank you for your support of that site. We received a lot of positive feedback and it helped us to make this site possible. We have lots of information on this website and have made efforts to verify alumni news. If there are errors and/or you have additional information to share, please contact Cynthia Heath(cmheath@gotricounty.com). On what street was the front entrance to Belhaven High School located? Should the 50th homecoming celebration be referred to as Grand Reunion II?